The Folklife Festival takes place entirely outdoors, sprawling across the National Mall between the Washington Monument and Capitol Hill. There are no walls, no quiet rooms in which to hit record and conduct interviews. Instead, Adam carried a mini studio kit in his backpack, one part ethnographic fieldwork recording equipment (hand recorder, windscreen, and notebook), one part studio podcast equipment (quality microphones, XLR cables, and large headphones for monitoring). We sought a quiet-enough place to record. Leslie found a small round table sitting behind one of the event tents and procured four folding chairs. We pulled out the recorder, plugged in the mics, and tested the sound. Our interviews would have some background ambience—an element of “being there” that we felt would be appropriate for the podcasts. Our first guest, Armenian artist and calligrapher Ruben Mayalan, greeted us with a loaf of freshly baked Lavash bread in his hands. “This is the traditional bread of Armenia, and it is meant to be shared,” he told us. We ate together while preparing for the conversation. When he was 21, Ruben and his family left Armenia for Israel so his father could receive medical treatment. As an immigrant and artist, Ruben was struck by the way modern architecture and classical art in Tel Aviv coexisted in the same space, and this came to influence his style of mixing traditional Armenian calligraphy and bold block script. “Art is a mirror for society…you can tell the history of a culture by looking at its art,” Ruben told us, before explaining how his own work reflects his views of Armenia’s recent turn to democracy. Adam Gamwell, Leslie Walker, and Ali Smith (Smithsonian Intern), interview Grammy Award-winning Armenian-American jazz musician Arto Tunçboyacıyan. We knew we were in for a powerful 10 days. This summer marks the third year the American Anthropological Association (AAA) has collaborated with the Smithsonian Center for Folklife and Cultural Heritage to incorporate our public education initiative, World on the Move, into programming at the Folklife Festival. This year the AAA, the Festival’s migration program On the Move, and the podcast team behind This Anthro Life came together to interview participants and curators to create audio narratives on migration, diaspora, displacement, and creativity on the move that will take listeners behind the scenes at the Festival. 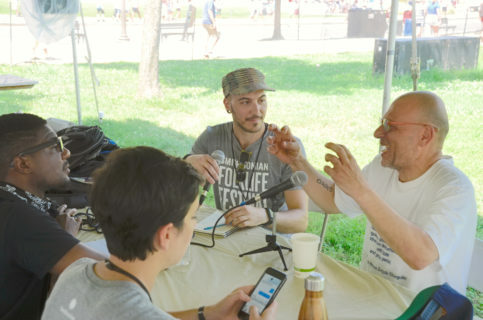 The theme of the 2018 Folklife Festival was Heritage Enterprise. For 10 days, presenters, curators, and members of the public engaged in cultural exchange by participating in a variety of workshops, listening to music, creating crafts, and eating traditional foods that celebrate this year’s featured nations, regions, and themes—Catalonia, Armenia, and Crafts of African Fashion. To create narratives linking the diverse peoples, perspectives, and activities across the Festival, we set about conducting a series of micro ethnographies. We combined observations of sessions, workshops, and craft demonstrations with interviews with Festival participants and curators. We also looked at documents and research notes from Smithsonian staff who curated programs for the Festival. We were specifically interested in speakers who presented on topics of migration and heritage industries, and practitioners who are skilled at narrating and demonstrating their craft. We spoke with Soumana Saley, who shared stories of learning to become a master leather craftsman and how the tradition is grounded in the knowledge and skills of his local communities. Saley and other West African artisans at the Festival use these traditional practices in the African fashion industry. The cultural enterprise of handmade fashion plays an important role in sustaining their communities as they travel abroad to sell their merchandise, but it also provides buyers an opportunity to appreciate the labor and skill involved in creating the items. Adam moderated one of the On the Move narrative sessions in which master Armenian embroiderers shared their stories and experiences of displacement and migration across Armenia and Syria. Embroidery became a way of connecting with their grandmothers who fled to Syria during the Armenian genocide in the early twentieth century and also with their sense of home when they had to migrate back to Armenia in recent years. In the spirit of This Anthro Life’s conversational podcasts, we used an open format interview style, which focused on themes such as art or music with few set questions. This allowed participants to define in their own words the relationships between their artisanship, musical ability, or experiences and the ways in which migration and movement shape their lives. Conversations with curators and other researchers supplemented the interviews with Festival participants, and helped us to identify the research involved in selecting participants and the presentation of cultural heritage for the Festival. This approach allows us to foreground a central or thematic conversation and to narrate events and activities at the Festival that listeners can paint in their minds as if they had been there to experience it. The podcast series is currently in postproduction; we are sorting through more than nine hours of audio material to produce a series of 15-minute episodes that cut across themes such as art as resistance, music and human connection, and defending immigration. We aim to release the series in the early fall, so listen up for announcements from the AAA, the Smithsonian, and This Anthro Life! We hope that listeners come away from the series understanding the resilience of immigrants as they adapt to and thrive in new environments—despite violent conflicts, environmental changes, and displacement—by drawing on their heritage and community support. The Folklife Festival showcases how support and cross-cultural understanding come in many forms—and they are needed now more than ever. Adam Gamwell is the co-host and executive producer of the This Anthro Life (TAL). TAL’s mission is to demonstrate the value of anthropological methods, thinking, and storytelling, and to generate dialogue, promote social consciousness, and foster wonder at our diverse worlds. Check out thisanthrolife.com for more information.